The Middle East hospitality market, in the context of the global tourism, is relatively robust, performing strongly and still growing. The February 2016 Pipeline Report by STR shows 151,454 rooms in 538 hotels under contract (in the construction, final planning or planning stages) in the Middle East. Narrowing the data down to rooms ‘in construction’ only, and in the Middle East there are 80,344 rooms in 252 hotels under construction as of February 2016 – a 42.5% year-over-year increase. Among the countries in the Middle East and Africa, Saudi Arabia reported the most rooms ‘in construction’ with 34,753 rooms in 77 hotels, and the UAE followed with 26,957 rooms in 92 hotels. Looking at this in relation to the economy, the direct contribution of travel and tourism to the UAE’s GDP was AED 61.6bn (4.1%) in 2014, according to the World Travel and Tourism Council, with this forecast to rise by 4.9% in 2015. Indeed, as an industry, hospitality and tourism is a key component of the strategic development of most GCC states and in some, like Dubai, critical to the economy. Deloitte reports total development activity within the hospitality and leisure sector to be estimated at US$24.1bn. Nowhere is this truer than in Dubai, where the market fundamentals are secure, with the growth in tourist numbers on track to meet the emirate’s target of 20 million visitors by 2020. Dubai International Airport has retained its position as the world’s busiest airport for international passenger traffic, up 12% in 2015 over 2014, while the total visitor number to Dubai last year was 14.2 million, an increase of 7.8% over the previous year. India, Saudi Arabia and Oman are largest three source market of visitors to Dubai, contributes almost half of its visitors. 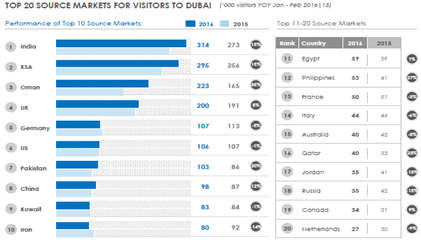 The figure shows sources of visitors to Dubai n Jan- Feb 2016 and 2015. In February 2016, Dubai saw a 3.5% decrease in occupancy to 82.5% as well as double-digit drops in ADR (-11.6% to AED833.78) and RevPAR (-14.7% to AED687.63). The emirate, Dubai wasn’t alone, and overall, as a subcontinent, Middle East hotels posted occupancy levels at 70.2% in February, representing a decline of 5.3% compared to the same period in 2015. Average daily rate for the month was down 10.5% to US$182.45, while revenue per available room dropped by 15.2% to US$128.12. Latest data shows the trend continuing into 2016, as supply growth outpaces demand, affecting both occupancy and ADR. This year, 31 hotels will be completed, increasing room inventory by 14% (9,300 rooms) to total 76,500, estimates Deloitte. Even in 2015, eleven hotels opened in Dubai, adding 2,800 keys. In the same year, Dubai saw average occupancy decline -1.4% to 77.5% compared to the previous 12 months, according to STR, and average daily rate (ADR) fall by approximately-7.4% to AED797 over the same period. Dubai’s hotel occupancy averaged 84.7% in Q1 2016, down from 85.6% in the same period of 2015. 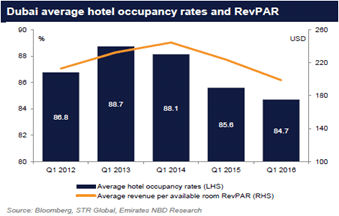 Meanwhile, average revenue per available room (RevPAR) fell sharply y/y. In Q1 2016 RevPAR decreased by -11.1% compared to -8.5% the same period last year. RevPAR stood at an average of AED 730 (USD 200) in Q1 compared to AED 821 (USD 224) in Q1 last year. RevPAR expected to stay under pressure. The supply of hotel rooms in Dubai increased by 6.5% y/y in Q1 2016 to 82,760 rooms. The Department of Tourism and Commerce Marketing (DTCM) is targeting 140,000 to 160,000 hotel rooms by the end of the decade. Data from STR Global also shows that a further 20,291 hotel rooms are currently under construction in Dubai, of which 10,019 are due to come online by year end. Another 23,956 hotel rooms are in planning stages as the table below shows. According to the latest data from STR Global, the supply of hotel rooms in Dubai increased by 6.5% y/y in March 2016 while demand also increased by 7.9% y/y the same month. With the supply of hotels rooms still outpacing demand growth for Q1 2016, occupancy rates are likely to remain stable or ease slightly with demand gradually catching up in the run-up to the 2020 Expo. “While Dubai’s economy is less affected by oil revenue than other UAE and GCC states, the downturn in oil prices nonetheless is forecast to prompt fiscal reform” say the EIU. According to Deloitte’s analysis, the cumulative effective of the removal of fuel subsidies, inflation forecast at 3.4% in 2016 and generally stagnant salaries, is likely to lead to lower disposable incomes for some households. The typical result of this is reduced spend on consumables, leisure, restaurants and hotels. As a result, Deloitte predicts that in the short-term (2016- 2017), the delta between hotel demand and supply will widen, with occupancy levels of around 70-75% representing a “new normal” in Dubai. Analysts urge us not to view this negatively, as Dubai remains one of the world’s best performing hospitality markets, but for those working in the industry, with pressurised budgets calling for a hike in sales and reduction in costs, the impact is real. Hotels in Dubai noticed a drop in KPI’s due to several factors such as additional room supply, general macro-economic conditions coupled with Chinese economic slowdown, Eurozone’s sluggish growth and reduced visitation from Russia due to the significant devaluation of their local currency to the lowest level ever. The vision “2020” and Expo 2020 will add flavour to the hospitality industry. 20 mn visitors expected by 2020 is one of the key driving keys of hospitality industry in Dubai.